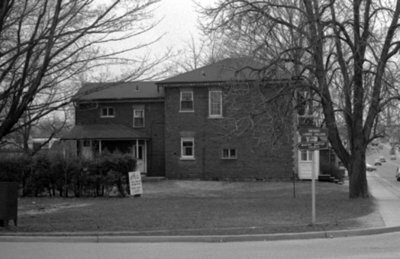 A black and white photograph of 425 Dundas Street East. View is of the side of the house from Reynolds Street. This large two storey brick house is located at 425 Dundas Street East. The house was built in 1859 for William Burns a pioneer of Whitby and a local merchant. An addition was built to the east of the house in 1987. 425 Dundas Street East, c.1970 , Brian Winter. Whitby Archives A2013_004_072D.